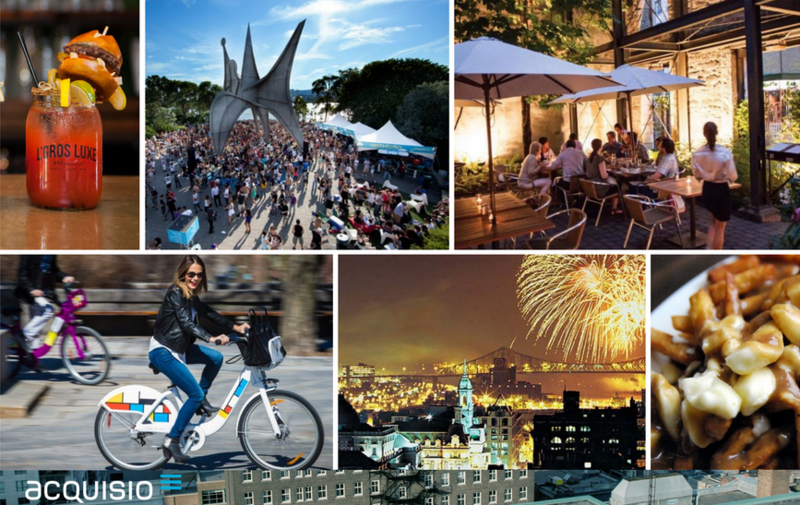 This July Acquisio is hosting a Summit in the beautiful city of Montreal. If you’re hesitant to venture over to Canada, especially if you’ve never been, here’s what you’ll be missing. Montreal is famous around the world for all of the right reasons. Here, you’ll find world-class shopping, a thriving music scene, some of the world’s best restaurants and bars, and a cultural heart that beats louder than any other city in North America. Montreal is a mish-mash of many different backgrounds, and while the core language and culture is French, the city has been blessed with many different influences from all over the world. Take advantage of the nightlife, and don’t forget to stop and admire the old-world architecture mixed in with the new-world charm that has made Montreal one of the most popular tourist destinations in the world. And there are enough churches that you can probably get a confession in if you need to before you head home. If you like music, then you’ll probably think Osheaga is pretty damn cool. Showcasing up and coming local artists and bringing together recognized musicians from across musical genres, Osheaga has something for everyone. Celebrating its 10th anniversary this summer, Osheaga Music and Arts Festival in Montreal is one of the biggest indie music festivals in the world, attracted more than 135,000 music fans from North America and Europe each year. It’s no coincidence that we schedule our Summit right before the weekend music festival. Extend your trip and get to both events to maximize your time in Montreal. A three day pass is your golden ticket to the art exhibits and musical performances all weekend long, but the festival can be pricey. If that sounds like an exhausting overload, you don’t have to buy a ticket to festival to have fun, there are lots of things to enjoy in the city throughout the weekend. With thousands of music enthusiasts in the city, there are tons of free or paid shows in bars and restaurants across Montreal to meet the demand for good music. Look, that’s just a simple fact. The best thing about Montreal is the food. Whether you want to or not, a couple of days in Montreal is all it takes to gain a few pounds. You can work it off when you get home, but while you’re here, just enjoy as much of the amazing food that this city has to offer as you can. Smoked meat, poutine, Montreal bagels, shepherd’s pie, and a whole lot more all await you. You’re welcome. A Montreal tradition since 1928, Schwartz’s smoked meats have been enjoyed by everyone from Hank Aaron to Angelina Jolie. Schwartz’s does their smoked meats the old-fashioned way—by marinating the meat for 10 days in a special blend of herbs and spices—no preservatives! If you’re hankering for a late-night snack, you can’t go wrong with La Banquise. Open 24 hours, this place is best known for its tasty poutine, a French fry/gravy/cheese curd concoction that is totally delicious and likely extremely bad for you. Situated in the heart of the Plateau-Mont-Royal, which is considered by many as one of the coolest neighborhoods in the entire continent, Brunch at l’Avenue is known for long lines—likely due to its out-of-this-world Eggs Benedict and delectable French toast served with caramelized fruits. Aside from its great food delivered in generous portions, this funky scene also offers a unique visual experience—be sure to visit the restrooms (yes, the restrooms!) to check out the wall art and red lights. If you walk up to Beauty’s Restaurant for brunch and see a long line, and wonder if you should stand in line or go somewhere else, take our word for it: stand in line! The number one breakfast/brunch spot in all of Montreal, Beautys has the best smoked salmon and cream cheese bagel you have ever eaten in your life. And to think you almost let a little line get between you and that bagel!?! Not feeling in the bagel mood? Try their MishMash omelet, a tasty egg dish that also includes peppers, onions, hot dogs, and cheese. Yes, we said hot dogs. Lunch at La Binerie Mont-Royal a place to sample authentic Québécois food, including such delicacies as meat pie, meatball and pig’s feet ragout, shepherd’s pie, beef and vegetables, and pea soup. With just a few tables and a long counter, this tiny eatery has been welcoming patrons since 1940. Well-known for its tasty juxtaposition of foie gras on poutine, Au Pied de Cochon is a must-visit Montreal eating experience—but make your reservations early, as a month-long waiting list is not out of the question. Chef Martin Picard frequently works both sides of the house, leading the cooking in the kitchen and then talking and drinking with his customers. Bring your appetite and your cholesterol-lowering medications, as you’ll probably need them both for this truly unique culinary experience! Which is better—a Fairmount bagel or a Saint-Viateur Bagel? Try them both so you can take sides in this friendly rivalry. Both bagel stores sell fresh bagels 24 hours a day, and both offer a delightful alternative to the New York style bagel many of us are used to, with bagels that are a bit smaller, a bit less chewy, and oftentimes on the sweeter side due to the addition of malt syrup or honey. Your visit to Montreal isn’t complete until you’ve had a drink at the Irish Embassy–and if beer is your drink of choice, you’re in luck! Known for its huge selection of beers on tap, the Irish Embassy is smack dab in the heart of downtown Montreal nightlife, making it a great place to start the night or grab the last drink of the evening. And if all that drinking makes you hungry, consider the fish and chips–they’re delightful! If you’re looking for authentic (and authentically delicious) Chinese food in Montreal, head over to Chinatown! There, you’ll find two restaurants that the locals flock to when they’re in dire need of their Chinese food fix. Restaurant Beijing is known for its seafood and its homemade noodle dishes, while Pho Bang New York is coveted for their super-crispy, super-tasty spring rolls, as well as their delicious Pho soup. 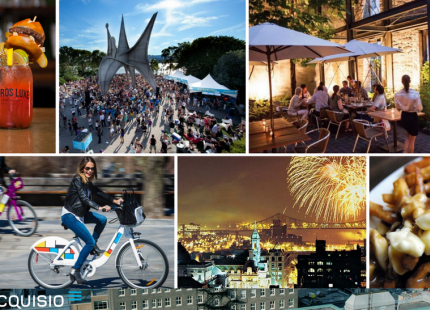 Montreal is gorgeous in the summer, food is delicious year round and the music festivals are top notch, but this year Montreal will become a hub of digital marketing expertise and information for businesses hoping to expand more into local and mobile environments. So come to Montreal for the atmosphere, music and food, but bring back lasting insight to your company courtesy of the Acquisio Summit.